For a solo, this is one BIG performance. 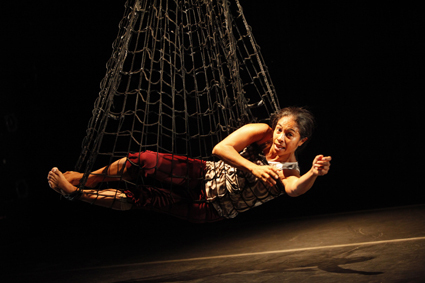 Accompanied by video projected onto a corrugated iron wall upstage and a long fishing net suspended from the ceiling, Pigram otherwise fills the space for 60 minutes with her intense presence. 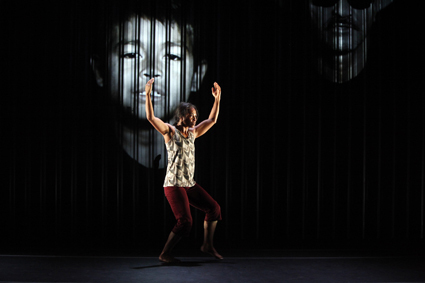 Gudirr Gudirr (the words call a warning) is a powerful commentary on life in multi-racial Australia told through the experience of this dancer who has a Malay father and Aboriginal mother and lives and works in the country’s north-west. From time to time, the video reminds us of the locale with at once calming and unsettling images of the place and its people. Disoriented movement matches angry verbiage as Pigram proselytises from the stage about the pressing need for action on Indigenous issues and follows up with a funny and expletive filled outburst, complete with waving arms, head-banging and huge projected FUCKEN text!, in sheer frustration at the time it’s taking for justice and fairness to prevail. Mood shifts again as we witness video of young Indigenous boys fighting one another—images they display proudly on Facebook. Pigram is still, facing us directly, silently wringing her hands, and then slapping her own face. In one month alone in 2010, seven young people in Pigram’s community killed themselves, the youngest 13 years old.